For School - how to adopt and implement the program? Determine prizes, awards or recognition for students. This is optional but highly recommended as it will help entice students to do all challenges. Coordinate math challenge submission process with teachers and school staff. 2. Teacher and Principal support. It’s helpful to have teachers and principal’s approval from the start. Explain to them that the program is an enrichment that brings opportunities to students and their families to have fun with mathematic. With teachers and the principal supports, you will be able to reach out more to your students (and submission process will be much smoother). 3. PTSA Support. It’s helpful to also have PTSA support, especially if you want to have an incentive program as recognition to students who participate in the program. PTSA may be able to provide funds to purchase these prizes. 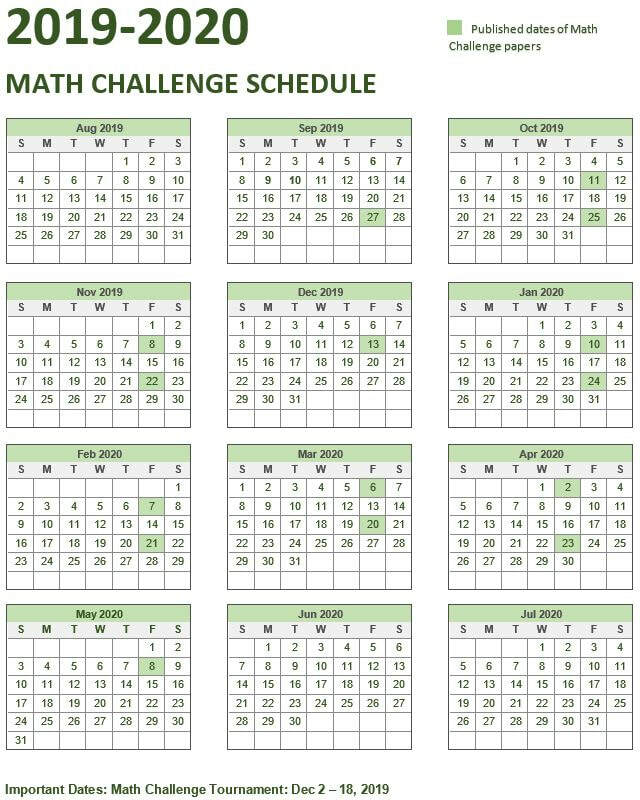 Deadline for schools to participate at 2019/2020 Math Challenge Program is September 1, 2019. ​Please read on to get details on how to implement the program. When your school is ready to adopt the Math Challenge Program, register your school HERE. Contact Elly Sarwono at mathchallenge@mathinaction.org for any question. A number of tasks are needed before the first Math Challenge published. Below are general timelines from getting the words out at the beginning of school year to ending the program in June. Please adjust accordingly to your school's newsletter deadline and weekly announcement. Get the necessary approval and support from your principal and/or PTSA. It’s great if you have both on board with the program. Propose to PTSA/PTO an incentive plan for the program (optional). If you are planning to give out prizes, get a budget approved by the PTSA/PTO. Work with your school office to establish how to collect submissions from students. Send us your school logo or picture for your school page. Write an instruction for your student how to participate (to be posted on your school's page) and your email contact or the MC Chair's email. Established due dates plan for 2018-2019 calendar. Please edit and send us the MC schedule that works with your school calendar. Note that solution will be posted online on the published date of the next Math Challenge. Create a flyer to be include to the school's 'FIRST DAY PACKET'. A colorful half sheet flyer works well to introduce the program to students/parents (optional, but recommended). Add the link of your school's page to your school's website and PTSA website. Write an article for your newsletter introducing this new program. The basic What, When, Who, and How/Where to submit format works well. Provide a link for your newsletter, school website, PTSA/PTO website. ​Send a brief email to teachers introducing yourself, the program, and how they can help collecting submissions. ​Make posters to create awareness. Send a brief announcement (to the school office, to teachers, to newsletter, to PTSA website) about the first Math Challenge, its due date, and information to students on how to submit their solutions. Provide the link to your school's page. Send a request to school office to be included in the morning announcement that the Math Challenge is available online to print/download.​ ​Remind students of the Math Challenge due date. Provide the link to your school's page. Send to your newsletter editor a short article for every math challenge published. Include due date and the link. Send a brief blurb to the school office for morning announcement. Collect submissions. Record on spreadsheet. Correct papers and give back to students (optional). Announce winners and distribute prizes (optional). ​Award students who continued to participate throughout the school year. You may give certificates or medals to students who complete 10 or 12 sets of math challenge. Simply create a big wall where you can display all students names (by grade). Decorate it with math symbols. Call out names during end of the year school assembly. For prizes, Norman Rockwell Elementary had a lottery system for each challenge. 12 qualified entries are picked. I believe they did this so that at least each student will get a prize in the rotation (12 x 15 challenges). Prizes are budgeted and set at the beginning of the school year. Rosa Parks and Smith Elementary both graded the students' solutions. It took them sometimes, but they have a couple of volunteers to grade the papers. Rosa Parks gave back each math challenge. Smith gave papers back at the end of the program. Most schools gave end of the year awards (medals or trophies or certificates). Not all schools give prizes for each challenge. Ideas that came up if schools do not have budget to give prizes: get shout-out from principal during morning announcement, lunch with the principals, famous mathlete picture (photo taken with 'math bear' or 'math beagle'). Rosa Parks had point system in place instead of asking students to do the minimum requirements of solutions. Students collected points through out the 15 challenges and organizers record those points. Alcott and Milburn give options to students to submit solutions online using google doc.